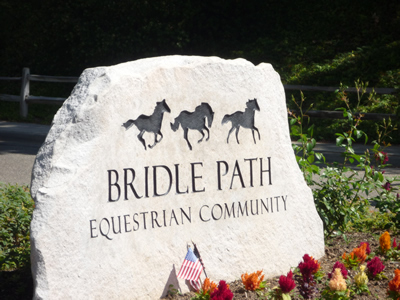 Bridle Path is a beautiful and rustic equestrian community located in southwestern Simi Valley against the north side of the Santa Monica Mountains Recreation Area. Established in 1978, the community consists of 630 homes, each on one-half acre or more of land; 7 arenas; 2 round pens; and one 1700-acre private mountain park on the south side against Challenger Park reserved exclusively for association members' equine and pedestrian activities. Horse trails run on one side of all of the streets in the community and connect to the trails in the private mountain park. At most any time of the day, you will see people out walking, riding, and playing with their horses.